Does anyone ever get flowers on their Marcgravia species? I only have rectiflora and I have never seen any flowers on mine. I've had it for less than a full year though at this point. None seem difficult to grow but I don’t think I’ve ever seen any flower. Makes me wonder what I’m not doing right. The flowers look really cool. Somewhere I seem to have read that Marcgravia sp. is a fairly massive plant when it flowers. Maybe an enclosure the size of a department store would be in order....hhhmmmm! varanoid and I'mNew2Frogs! like this. 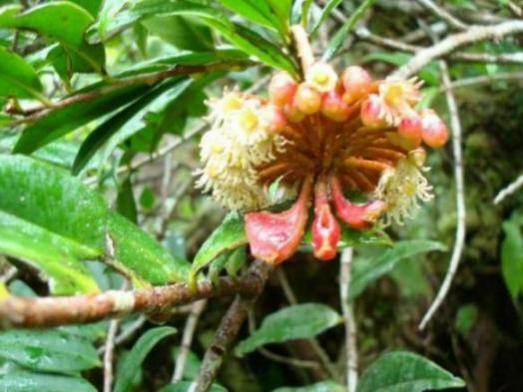 Most viv specimens of Marcgravia are perpetual juveniles - the substrate-clasping foliage, which makes it such a viv favorite, is absent from the adult branches from which flowers arise. Those branches are arching/pending and 2 or more feet long. The flowers are indeed amazing - their odd shape and organization are adapted for bat pollination. You won't see flowers unless you can provide for multiple, large adult branches which requires conservatory-scale accommodations. How large are the plants you're working with? When I hiked in the rain forest in Puerto Rico, I saw alot of Marcgravia in juvenile and adult form. Out of 100's of plants showing adult foliage, I only saw a few in flower. I tend to think rtbaum is correct that only large adult plants produce blooms. The flowers in their pendant umbel are quite fleshy and robust and would seem to require an enormous investment of resources. Wow that is incredible. I had no idea their blooms were that impressive.